Not sure what to call it but, whatever it is, it is finished and on its way in the post: I showed you the 2nd page before: Here is the final card/book I have made for my Bro-in-laws 40th. 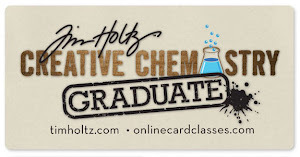 It is DL size so it is actually just from one piece of A4 card and fitted easily in to an envelope. 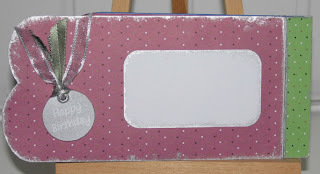 Hope I get the credits right now: Front cover and letter B from Shabby Princess Dinner Party digi-papers. Halloween page and 'O' from Funky Fairy Papercrafts digi-papers with ghosts from Debbie's die-cuts. 3rd page - Papermania paper and layered Cuttlebug die-cut camera. He's a very good photographer. I am especially pleased with the little film strip I made (shown right) with a mini-square punch and black paper and a random selection of B&W google images printed on to acetate and mounted behind. Fiddly but worth it. 4th page - Last one I made: Papermania papers and a collage of google images of main places they have visited (Japan & US) and are about to visit (snorkelling in Egypt). The 3D elements don't show well as I have photo'd it face-on and only used thin foam to avoid it being too bulky. 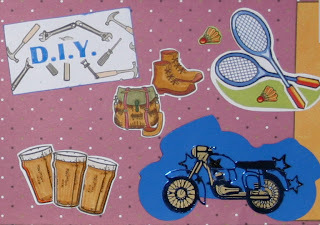 5th page - Papermania paper with a mix of hobby images: e.g. motorbike die cut, stamped with stars and Sakura glazed with Anita's sticker in blue & gold layered over; DIY masked with images stamped over, boots, bag and glasses stamped with SeeD stamps, coloured with Whispers markers with some 3D, some glazed. 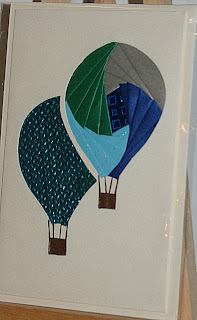 Badminton racquet is a google image with 2nd layer decoupaged on 3D foam. Finally - Papermania paper, Stamped SeeD sentiment (on foam) and inked edges with silver Brilliance. Inked down the score line and stuck the paper either side of it so the paper wouldn't lift with being bent back & forth. Scored the border with the Eazi-score board repeatedly while I was making it so, after sticking the border edges together, the pages still turn really well. Husband advised against punching and adding fibres and, as it was for a bloke, I resisted the temptation! Thanks for looking and your encouraging comments when I showed the first page I made before. 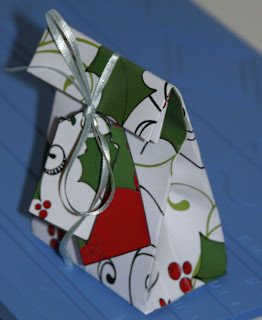 This week's Funky Fairy challenge was to make a non-card Christmas something so I used my Eazi-score board to make a quick gift bag. I love my board as it means I don't have to measure anything, just use the score lines so everything is really quick and neat. 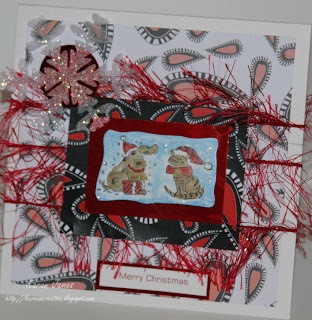 I love the Funky Fairy 'Merry Christmas' download collection so I printed a paper and matching tags, one of which I coloured red for more contrast. 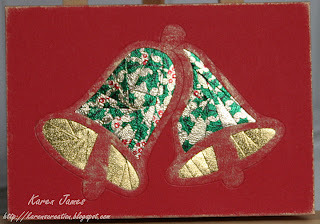 Pour le challenge 'Funky Fairy' j'ai imprimé un papier et des étiquettes de l'ensemble Funky Fairy 'Merry Christmas' et j'ai utilisé ma planche 'Eazi-score' à crée un petit sac de Noël. Avec la planche c'était très rapide et facile sans une règle! NB: There is Funky Fairy Candy on offer for 3 winners on the Inspirations Blog ! Total lack of computer yesterday and I thought it had gone for good but hubby finally managed to get it working again last night so I've been glued to it today - blog-hopping started by a couple of emails and then went on and on! Amongst all the lovely cards and things I've been admiring was tons of candy so have a look on the list to the right and join in the celebrations. They include Julie from Arty Girlz and Inspirational who is celebrating becoming a Stampin Up demonstrator along with folks who are new to the block celebrating 100+ hits through to those with zillions (only a slight exaggeration)! One of these is Kreativ Kristin who is celebrating 15000 hits. I decided that there is a distinct lack of Iris folding on many blogs so to make up for it... Real reason is that I have been asked to do a class on the technique next week so I needed to prepare some samples. 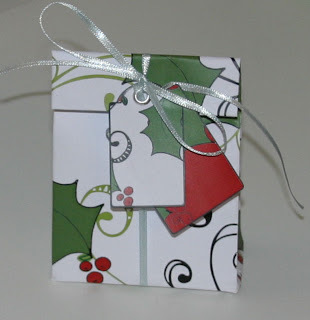 The group will have the choice of the Christmas patterns. All except the Bells are my own patterns. I bought aperture cards and then made up the pattern to fit. 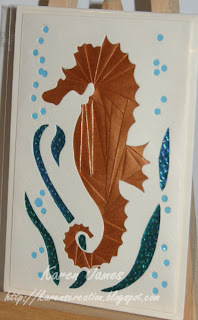 Embossing was with Cuttlebug folders. J'enseignerai cette technique 'Iris folding' semaine prochaine donc j'ai préparé mes exemples. Les participants peut choisir quelle dessin de Noël elle fera. J'ai fait tous les dessins sauf la carte de cloches, et j'ai fait les cartes après. Le gaufrage était fait avec le cuttlebug. 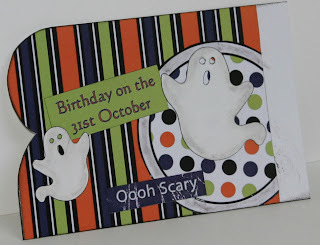 Funky Fairys Challenge #36 is to use the gorgeous halloween papers Shaz has provided as a free download - Thanks Shaz! I have used some here on the inside cover of a little book I am making for my bro-in-law's 40th on the 31st, hence the halloween link! I grunged and grunged with an old black ink pad, using a cotton bud to apply it to smaller areas and to take the shiny white off the die-cut ghosts. As 'Oooh Scary' is a phrase Rob uses quite often (in sarcastic tone and usually when my sister is playfully threatening him with something) that's also a play on words! The white strip at the side will be hidden when it is all put together. J’ai commencé un mini-album pour le 40e anniversaire de mon beau-frere. Son anniversaire est le 31 octobre donc, pour cette page, j’ai utilisé des papiers de la theme halloween de Funky Fairy: C’est le challenge cette semaine. J’ai utilisé aussi beaucoup de encre noir à vieillir le page et les phantoms. 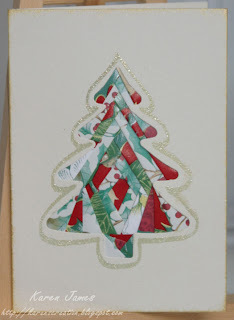 Karin has set up a new challenge blog offering a weekly sketch for just Christmas and birthday cards - The ones we usually need most of! It's called Christmas and Birthday Cards. 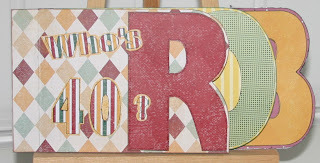 To celebrate she is also offering candy on her original blog - Scrap Everything until the 13th. I love the first sketch so hope to join in later. Also whilst 'hopping' I came across Martine's Craft Table: She's celebrating 10000+ hits with candy :) She has lovely cards and also blog backgrounds. Also found Priscilla's Skraptacular Designs blog: She has candy to celebrate her first 1000 hits: Great cards and a slideshow of her craft space that makes me want to cry with envy! This week's Kaboodle Doodle challenge was a sketch - My take on it is upside-down and using fibres for the horizontal stripes. Not at all what I had planned in my head when I started but there we are! 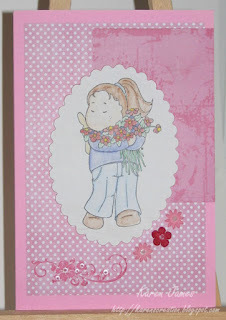 Papers: Kaboodle Doodle, stamps SeeDs with Brilliance ink and water colouring with Distress Inks. Snowflake cut on Cuttlebug from thin foam packing material and then stuck down and decorated with holographic glitter glue. After a great party with a bunch of kids doing treasure hunts and painting T-shirts as well as the usual pass the parcel and musical chairs on Wednesday, I have collapsed in a heap and haven't made a single card! Or maybe it was the stress of having to make the birthday cakes that did it! I have however provided one craft soirée and, after tonight's Téléthon (French charity) meeting, the number planned in the next 5 weeks has grown to 2 craft workshops and 2 craft fair weekends so I need to get cracking! In a bit of blog-hopping relaxation I found Nikki's candy of 2 gorgeous High Hopes stamps, and as if her great cards weren't enough of a reason to hop over there! And although it only seems like yesterday Susie at White Ribbon Cards was offering candy, she is generously offering more. Again great work to inspire you too. And I must be the last person on the crafting planet to not know this blog: SusanBlueRobot. Susan is offering candy to celebrate 200000 hits, and that's only since April, but there were another 13000 on top when I just looked! 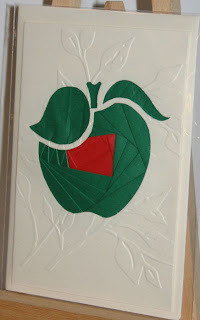 If you have any kind of computerised cutter you MUST look at her site and give yourself plenty of time: It's amazing! 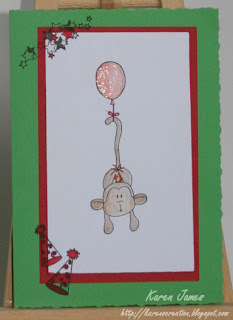 This is very similar to another card I made recently for my godson but this time it is for my son's birthday today. He's getting in to his guitar so the image is well-suited. Excitement has been growing the last few weeks until he burst in to our room at 7am for the first lot of present opening ! As there is no school on Wednesdays here, the party is tomorrow so we are still on high tension. 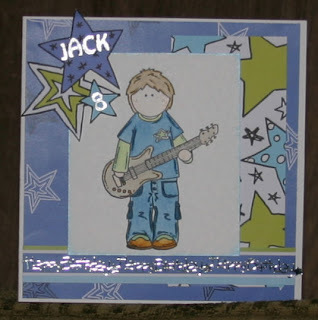 I followed the Sketch Saturday layout for his card with the image coloured with Whispers markers and Funky Fairy Boys papers. The image and stars are popped up on foam. I used silver peel-offs for the text which the flash has highlighted even more! J'ai suivi le dessin de 'Sketch Saturday' pour ma carte de l'anniversaire de mon fils aujourd'hui. 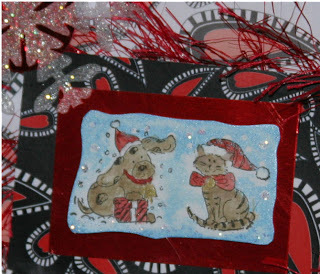 This card was made using Camilla's sketch on A Spoon Full of Sugar: It looks flat in the pic but actually has the main image plus the extra presents popped up on foam. The 2 papers are my own designs available on Kerudoc Création 'Winter' CD (along with lots of other colours & designs) with SeeDs stamps, Cuttlebug embossing. 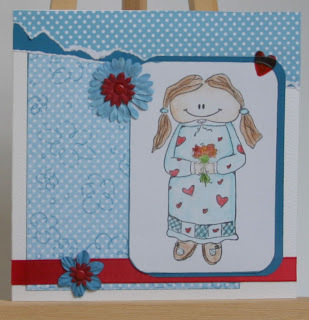 The Arty Girlz challenge this week is to use red on your card so, along with the card for the Ismaki challenge below, I made this card using red. 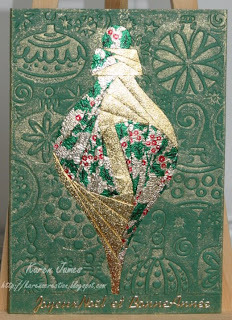 I made this card using the Funky Fairy sketch and pink FF shabby chic and basics papers and then just realised I hadn't followed the theme of non-trad Xmas: Ooops! Can't believe we were walking on the beach in perfect calm this morning enjoying reflections on the water and seeing a heron, egrets, an oystercatcher and lots of other lovely birds and now it's all wind and rain! 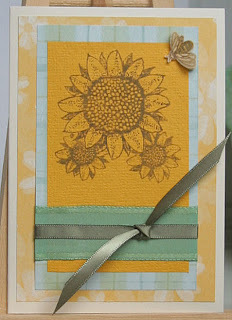 A quick card for the Sunday Stamper challenge: Masked the large sunflower to stamp the other two (and now wish I'd placed a third in the centre) and layered the bee on cream card and then tissue paper, sticking just the body so the wings can 'fly' and then attaching the bee with a foam pad so he is hovering. 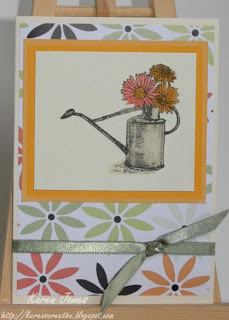 Stamps from an under-used SeeDs 'Sunflower' set with 'Frayed Burlap' Distress Ink. Having rediscovered the stamps I also made these couple with the same set, black Brilliance inkpad and coloured with Whispers markers. 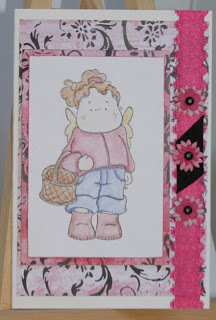 This week's Kaboodle Doodle challenge was to use the free download papers (thanks Andrea - I love the papers) so I combined them with sketch #33 from Sketch Saturday turned sideways to create this card. I love the lipstick colour and used watercolour pencils on the magnolia image to match. Also love the Maya Road ribbon but the flash has made that look a bit too bright. Ma carte pour les challenges de Kaboodle Doodle - à utiliser des papiers gratuits - et du sketch #33 de Sketch Saturday. J'ai utilisé des aquarelles avec le tampon magnolia. 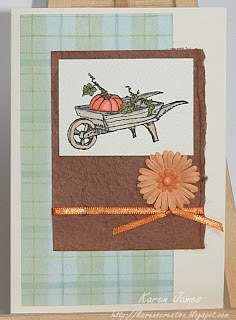 Here's a quick card using the Friday Sketchers layout but flipped upside down. 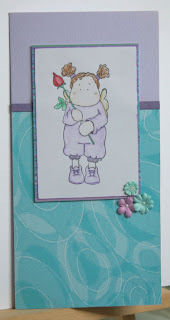 I've also substituted the stamped flower swirl for the text. Most of my cards are sold at some point and most people seem to prefer them blank for any occasion or sometimes I add text later. Ma carte pour le challenge de 'Friday Sketchers' mais sans texte. 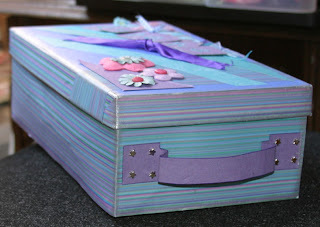 I joined in with a workshop on the Ascrappmoi forum yesterday and covered a shoe box to use keep my ribbon bits in. 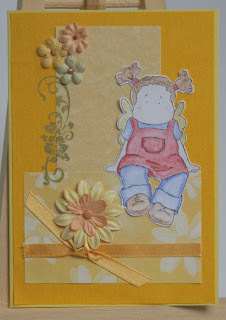 Then made a card with some leftover bits and a Magnolia image that I'd coloured with watercolour pencils a while ago. Ma boite de atelier Coha sur forum Ascrappmoi hier. C'est à garder mes morceaux de rubans. Apres, j'ai fait une carte avec des chutes! 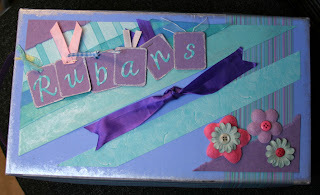 Used: Making Memories Blooms and Buttons and mini brads on the box, small primas and pearl paint on the card. Letters and tags cut with Cuttlebug Harmony alphabet.